Trevali Mining Corporation ("Trevali" or the "Company") announces results from eleven new drill holes in its ongoing 2016 underground exploration drill program at the Santander Zinc Mine in Peru. The aim of the current drilling is to test the down-depth extensions of Magistral North deposit and recently discovered Oyon zone. Drill holes continue to intersect multiple stacked mineralized massive sulphide replacement zones, or mantos, both within the main Magistral North body as well as in the Oyon mantos (Table 1). Mineralization remains open for expansion (Figure 1). 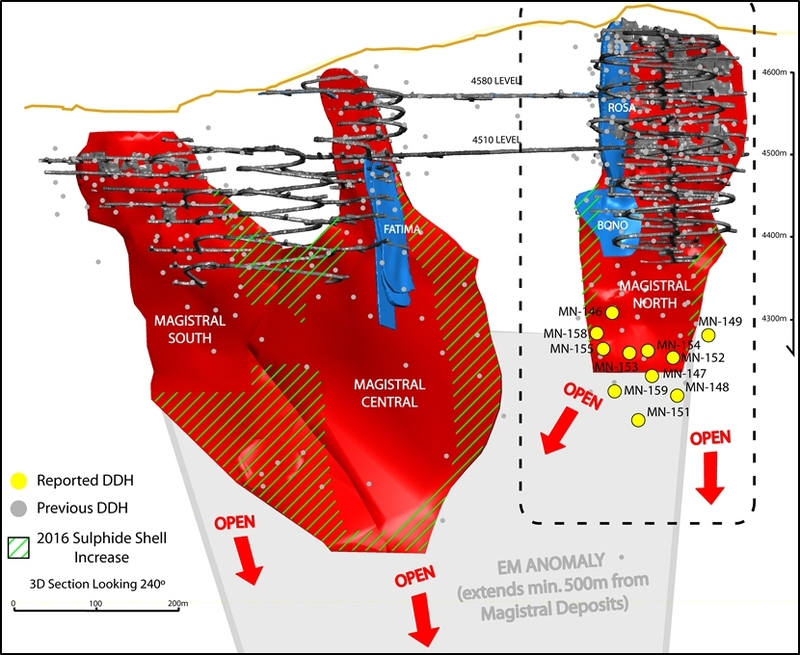 To view Figure 1: Cross section looking west showing Magistral Deposits with drill hole intercepts, visit the following link: http://media3.marketwire.com/docs/TrevFig1.jpg. Table 1: Summary of latest Santander Mine underground drill assay results. *True widths of the mineralized intervals are estimated at 60-70% of core length. The recently discovered Oyon mantos are located in the hanging wall to the main Magistral North deposit and are proximal-to-immediately-adjacent to existing and future planned mine development (Figure 2). As presently defined the Oyon zone contains multiple stacked lenses (or mantos) of replacement semi-massive to massive sulphide mineralization and associated veining that varies from 1 to plus-20-metres thick, a modeled strike length of approximately 100 metres and a currently defined dip length of approximately 200 metres. In general average grades for zinc, and particularly lead and silver, are significantly higher than current Santander average mill feed grades (Table 1). Furthermore the presence of multiple stacked massive sulphide lenses containing high lead-to-zinc ratios coupled with associated anomalously high silver values is indicative of the upper portions of a Carbonate Replacement Deposit (CRD) system, which given its location approximately 350-metres subsurface, suggests significant depth potential remains. The Company is currently fast-tracking ramp development in order to enable exploitation of this high-grade area at the earliest opportunity in addition to providing additional exploration windows to extend both zones. In the interim, exploration focus has shifted to the Magistral Central - Fatima zone which also remains open for expansion. 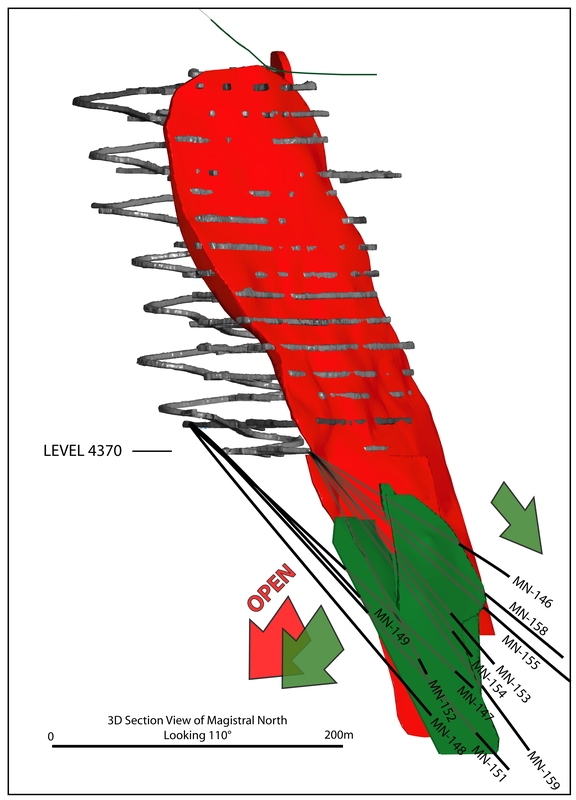 To view Figure 2: 3D view, looking southeast, and cross section illustrating geometry of the Oyon mineralization and location of recent drillhole intercepts in the Magistral North Deposit at the Santander Zinc Mine, visit the following link: http://media3.marketwire.com/docs/TrevFig2.jpg. EurGeol Dr. Mark D. Cruise, Trevali's President and CEO, and Daniel Marinov, P.Geo, Trevali's VP Exploration, are qualified persons as defined by NI 43-101, have supervised the preparation of the scientific and technical information that forms the basis for this news release. Mr. Marinov is responsible for all aspects of the work, including the quality control/quality assurance programs. Dr. Cruise is not independent of the Company, as he is an officer, director and shareholder. Mr. Marinov is not independent of the Company as he is an officer and shareholder. Drill core samples were processed and assayed in the Santander mine onsite laboratory. Zinc, lead and silver assays were obtained by Aqua-Regia dissolution followed by Atomic Absorption measurement. Values of lead and zinc over 15% are assayed by volumetric method. Analytical accuracy and precision are monitored by the analysis of reagent blanks, reference material and replicate samples. Quality control is further assured by the use of international and in-house standards. Blind certified reference material is inserted at regular intervals into the sample sequence by Trevali personnel in order to independently assess analytical accuracy. The onsite laboratory is outsourced and managed by SGS-Peru personnel. SGS-Peru's quality system complies with the requirements for the International Standards ISO 9001:2000 and ISO 17025:1999. Finally, representative blind duplicate samples are routinely forwarded to an ISO compliant third party laboratory for external quality control.